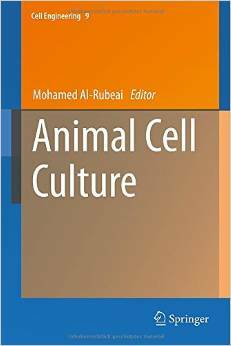 UCD Biochemical Engineering Professor Mohamed Al-Rubeai has published a new book: Animal Cell Culture. ​Animal cells are the preferred “cell factories” for the production of complex molecules and antibodies for use as prophylactics, therapeutics or diagnostics. Animal cells are required for the correct post-translational processing (including glycosylation) of biopharmaceutical protein products. They are used for the production of viral vectors for gene therapy. Major targets for this therapy include cancer, HIV, arthritis, cardiovascular and CNS diseases and cystic fibrosis. Animal cells are used as in vitro substrates in pharmacological and toxicological studies. This book is designed to serve as a comprehensive review of animal cell culture, covering the current status of both research and applications. For the student or R&D scientist or new researcher the protocols are central to the performance of cell culture work, yet a broad understanding is essential for translation of laboratory findings into the industrial production. Within the broad scope of the book, each topic is reviewed authoritatively by experts in the field to produce state-of-the-art collection of current research. A major reference volume on cell culture research and how it impacts on production of biopharmaceutical proteins worldwide, the book is essential reading for everyone working in cell culture and is a recommended volume for all biotechnology libraries. This entry was posted in Academic Activities of NISA Members on January 18, 2015 by admin.